City buses can be both a blessing and a curse as far as urban traffic is concerned. They can take a number of cars off of the road by offering an alternative means of commuting, but they can also hold traffic up with their low speeds and frequent stops. In an effort to clear up urban Chinese streets, a company called Shenzhen Hashi Future Parking Equipment Co. came up with this strange-looking futuristic bus concept. 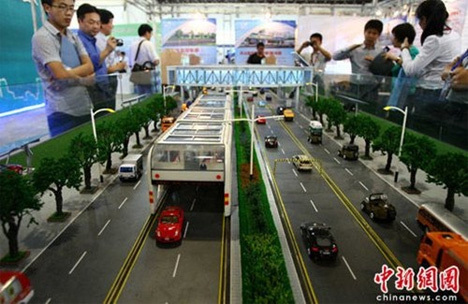 The 3D Fast Bus is a massive elevated two-lane-wide vehicle that actually straddles the lanes, with the main bulk of the vehicle riding well above the cars on the road. Cars can move freely below the bus, just like passing through a tunnel, and the bus has special sensors that send alarms when vehicles too tall to pass beneath start to get close. The passenger compartment isn’t nearly as dank and gloomy as the typical city bus; the design incorporates skylights and a more positive atmosphere to keep passengers happy. Which is no small task considering that one of these beasts can accommodate up to 1400 passengers. One of the most exciting parts of this design is that it’s run entirely on electricity, partly from the grid and partly from solar collectors. According to the above video (an English transcript can be found here), the elevated bus is much cheaper to build and operate than a comparable train, and it takes far less time to build. The first of these monster buses is set to debut in Beijing’s Mentougou District where it will hopefully answer the many questions surrounding how the public will deal with sharing the road with elevated buses. See more in Mass Transit or under Transportation. August, 2010.